This city, named after the goddess of love, looks as if it were built upon a hill. Not so. In fact, the mound that elevated the village has actually been built up by successive generations of inhabitants, like an anthill built in super slow motion, going back to the Early Bronze Age. Excavations here by American, French, and Turkish archaeologists have uncovered some impressive ruins, many of which have been moved to the town’s museum. 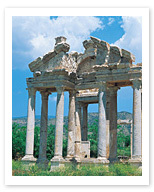 There, you may be particularly impressed by the products of the famous Aphrodisias sculpture school, prolific and much renowned in the ancient world, whose works you can admire here, though unfortunately the students have long since passed away.